Introduction: Microorganisms are recognized as the etiological agents for the majority of pulpal and periradicular diseases. Although bacteria are most researched, the contribution of fungi in endodontic infections is neglected. However, Candida albicans is the most commonly isolated fungi from the endodontic infections. Their identification is crucial for effective diagnosis and treatment planning. Hence, this study aimed to evaluate the presence of C. albicans in primary root canal infections using culture technique. 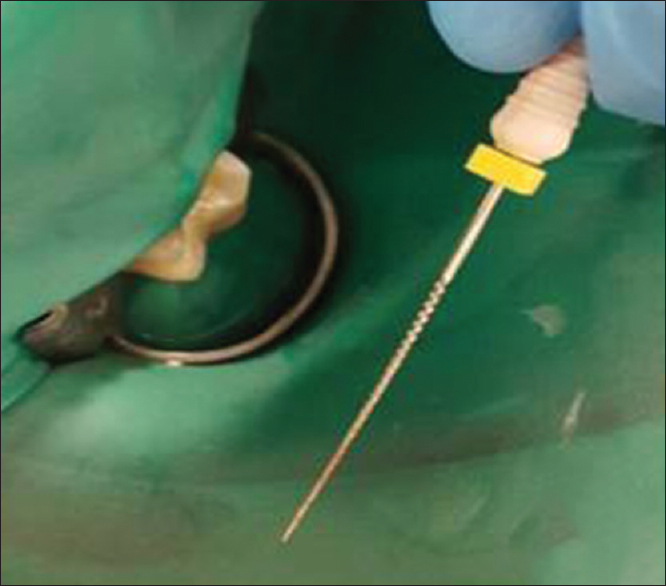 Materials and Methods: Fifty root canal samples from primary endodontic infections were collected using file and paper point following disinfection protocol. Samples were inoculated in Sabouraud dextrose agar and incubated for 2–3 days. Taxonomy was evaluated using Gram-staining and germ tube test by macroscopic examination and optical microscopy. Results: Four out of 50 samples showed positive for C. albicans. Conclusion: This study confirmed the prevalence of 8% of C. albicans in primary endodontic infection. Keywords: Candida albicans; fungi; primary endodontic infection. Endodontic failures attribute to as high as 30%–40% of dental failures. The most common reason for the failure of endodontic therapy is the persistence of microorganisms even after the treatment. The classical study by Kakehashi et al. has confirmed that microbiota is a major deterrent in endodontic infection. The current trend in medicine emphasizes on the understanding of the disease process rather than just mere treatment. Understanding the root canal microbiota involved in endodontic pathology has tremendously improved the success of root canal therapy. A paradigm shift has occurred from conventional to broad-spectrum treatment plan owing to the vast variety of microorganisms found in the root canal system. Furthermore, studies that aim at exploring the characteristics of the “most” resistant organism and the methods to eliminate them have been done at a wide scale. Their presence was first reported by Grossman in the range of 1%–17%. Not many studies have focused on C. albicans in primary endodontic infections. Hence, this study aimed to identify C. albicans in primary root canal infections. The research protocol was reviewed, and the study design was approved by the Ethics Committee. Patients visiting the Department of Conservative Dentistry and Endodontics, Faculty of Dental Sciences, MSRUAS, with primary endodontic infections were randomly selected for the study. Fifty patients with primary endodontic infection - irreversible pulpitis/pulpal necrosis/periodontitis/cellulitis/abscess were selected based on case history, clinical and radiographic evaluation. Patients with reinfection or presenting with systemic fungal infection or on antifungal medication were excluded from the study to preclude the confounding factor. Following informed consent, detailed case history was taken. The study population was categorized based on gender and under three age groups: 20–40 years, 40–60 years, and above 60 years. The microbial samples from the root canal were collected under strict asepsis. A rubber dam (HYGENIC ® DENTAL DAM) was used to isolate each tooth. The surface of tooth and the surrounding fields were cleaned with 30% hydrogen peroxide for 1 min. Disinfection of the operative field was done using 30% hydrogen peroxide (SDFCL) and 5% iodine dye (Wokadine Solution 5% w/v, Wockhardt Ltd.,), and neutralization was done using 5% sodium thiosulfate (NICE Chemicals). Samples were obtained from the main canal in single rooted teeth and largest canal or canal with periapical radiolucency in multirooted teeth. Any caries or previous restoration was removed by sterilized bur (SS White, Round bur). 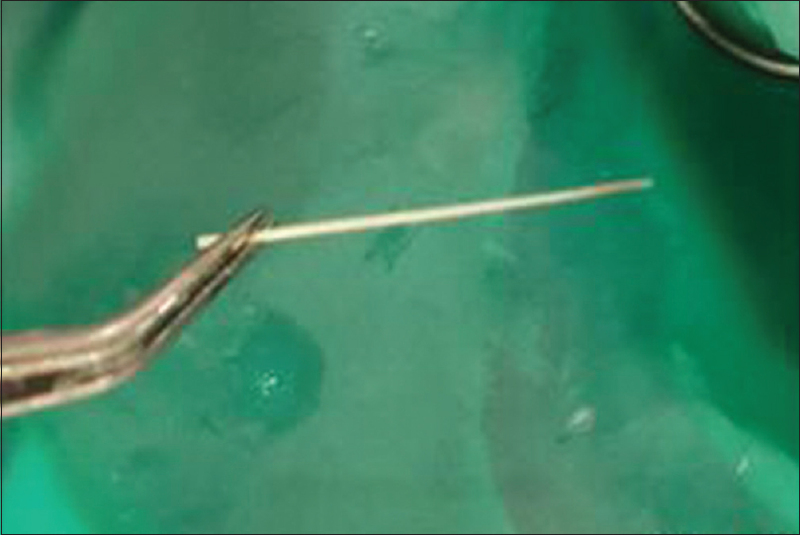 Access to the root canal was made using sterile access opening bur (MANI) and the root canal was irrigated using sterile saline, only to moisten the canal before sample selection. 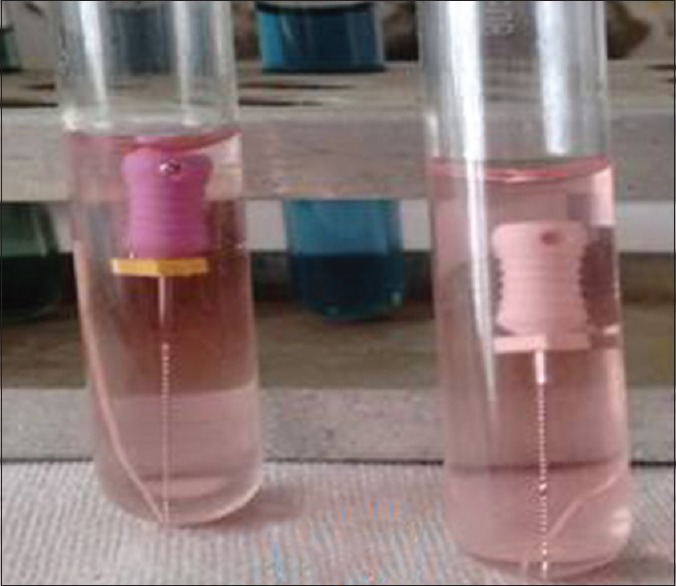 Two samples were taken from each canal:First using sterile K-file (MANI) [Figure 1]. up to tentative working length established using preoperative radiograph/electronic root canal length measurement device (Apex-ID-Kerr). The second sample was taken using paper point [Figure 2] by inserting it into the root canal for 1 min. The collected sample was immediately (within 4 h) transported in a sterile container to the Department of Microbiology, M. S. Ramaiah Medical College and Teaching Hospital, Bangalore. 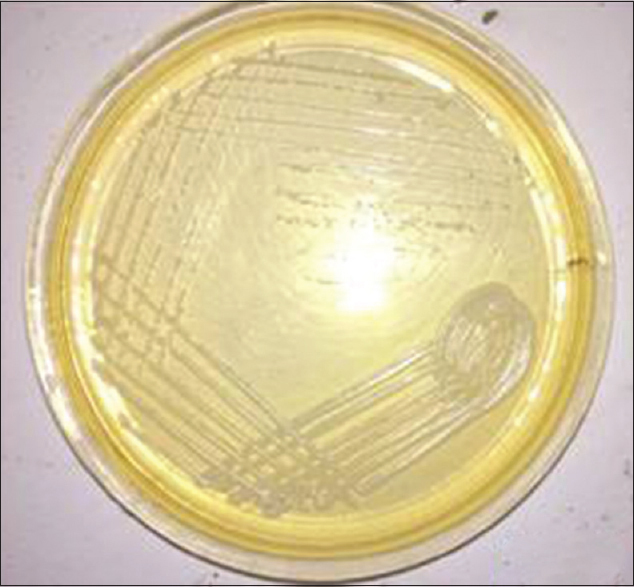 It was incubated in thioglycolate broth for 24 h [Figure 3], and the samples were cultured on moist-free Dextrose Sabouraud's Agar culture plate [Figure 4]. A heated sterile platinum wire loop was used to streak the sample on the DSA plate. The agar plate was then incubated for 2–3 days. If any macroscopic changes (cream colored, raised, smooth, and butyrous colonies) [Figure 5] were seen indicating the growth of fungi, it was viewed under the optical microscope to detect the presence or absence of Candida. 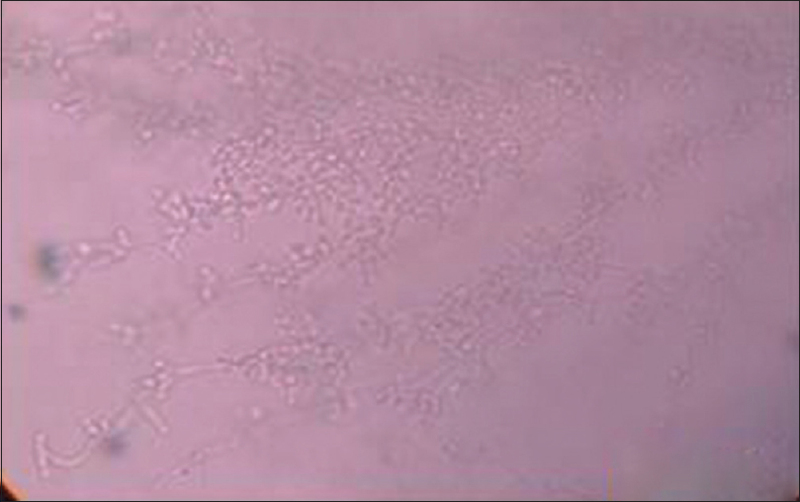 Gram-staining test was performed to confirm the presence of Candida [Figure 6]. 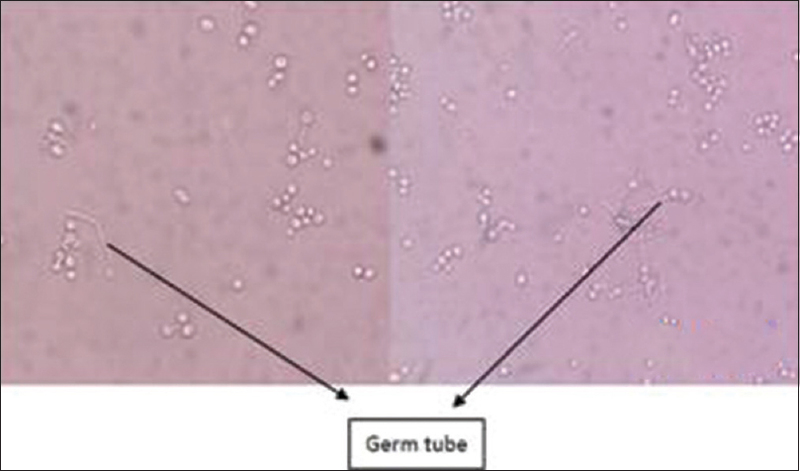 In case of a positive culture, the samples were further subjected to Germ tube test [Figure 7] to differentiate between C. albicans and nonalbicans. SPSS version 18.0 software (SPSS Inc, Chicago, USA) was used to conduct Chi-square test to assess the difference between males and females and prevalence of C. albicans among different age groups. No statistically significant difference was seen (P > 0.05). The study was conducted on fifty patients in the Department of Conservative Dentistry and Endodontics, to evaluate the prevalence of C. albicans in root canals with primary endodontic infection. According to the methodology adapted, the following data were obtained [Flowchart 1]. The study population was divided into three age groups [Table 1] first group included patients in the age range of 20–40 years, second group in the range of 40–60 years and third group included patients above 60 years. Each group was further subdivided into on the basis of gender. Out of fifty samples, seven samples were identified as fungi. Four out of seven samples were identified as Candida, by showing positive germ tube test. Hence, four out of total fifty samples (8% of samples) were tested positive for Candida. Three out of four samples were of female patient. One patient between the age group of 20–40 years and one in the range of above 60 years, whereas in the age group range of 40–60 years samples from two patients were found to be positive for C. albicans in primary root canal infections. Root canal infection is caused by interplay of microorganisms, hence characterized as a mixed infection. Other than Gram-positive cocci and obligate anaerobes, fungi also have been isolated from root canals of infected teeth. They have been mainly reported as a potential cause of endodontic failure in root filled teeth, attributing to its opportunistic invasion in infected root canals. The earliest report on the presence of fungi was made by Grossman in the year 1952. However, its presence in primary root canal infections is not given its due consideration. The most commonly encountered species of opportunistic fungal pathogens in humans are members of the genera Candida. Even in case of persistent or refractory periradicular diseases, Candida has been found to be pioneer microorganism. The oral cavity is a habitat for Candida in more than 50% of the world's population. This is, however, a nonpathogenic stage. It is when the Candida species become infected and invade the host tissues, they cause the disease process. The transition of Candida from a harmless commensal to a pathogenic organism appears to be dependent on minor changes in predisposing conditions which cause the expression of a variety of virulence factors. These factors include adherence, hyphal formation, thigmotropism, protease secretion, and phenotypic switching phenomenon. The results of our present study showed the prevalence of 8% of C. albicans in primary untreated root canal infections. This is in accordance with the literature reporting the occurrence of yeasts in infected root canals between 1% and 17%.,,, Nair et al. have also observed yeast colonies in apical thirds of two out of nine biopsies. After studying the prevalence of Candida species in different oral sites, Najzar-Fleger et al. have found that 55% of root canals contain Candida cells. The gender distribution of the samples was 27 males and 23 females (1.17:1). Three samples among females (13.04%) and one sample of males (3.70%) were positive. Ratio of occurrence of Candida species between males and females was 3.52:1. In another similar study, the ratio was seen to be 2.55:1. This result was also in accordance with a study done by Berdicevsky et al. who reported similar results. Difference in C. albicans occurrence between two sexes was statistically insignificant. Recent studies have shown a higher prevalence of 21% by polymerase chain-reaction-based (PCR) molecular detection technique., The study also reported yeasts in low numbers at the start of root canal treatment, which may eventually reach much higher proportions during conventional treatment procedures. 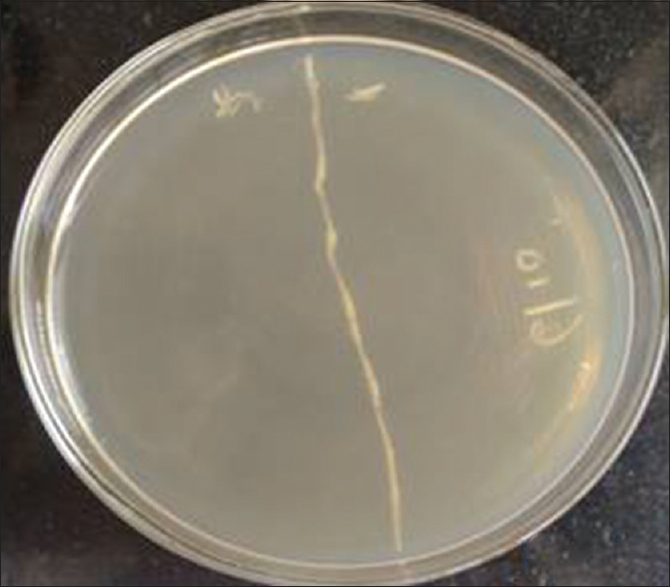 In the present study, selective Sabouraud's Dextrose agar was used as a culture media that is specific media to allow growth of only candidal organisms. The presence of C. albicans was confirmed by the germ tube test. A possible explanation for the multifarious results could be due to the difference in isolation methods, microbiological analysis (culture/molecular), systemic conditions, and geographical variance among patients. Molecular techniques such as PCR are more sensitive than culture methods. Higher number of microbial species has been identified using molecular detection methods. However, molecular techniques cannot completely replace the culturing methods as they cannot give information about the viability of the organism. This might lead to overestimation of the organism giving false results. The goal of investigation will determine the choice of method employed. Culture methods are gold standard when effective treatment planning is the main aim. However, molecular diagnostic methods are highly sensitive in the identification of causative organisms. The result of our study indicates the need for using intracanal medicaments and irrigants which have both antibacterial as well as antifungal action. Such investigations can also bring a paradigm shift in the chair-side diagnosis of endodontic infections. This study aims to emphasize the possible role of C. albicans in endodontic biofilms which has been overlooked for decades. Furthermore, this study might pave the way for the need to develop antimicrobial agents which are not only antibacterial but also antifungal. However, the limited sample size with only microbial culture analysis gives us only an initial insight to the endodontic microbiology. With the employment of advanced technologies, there is a vast array of scope for improved identification and diagnosis of microorganisms. This study confirms the presence of C. albicans in primary endodontic infections. C. albicans though inconspicuous in the presence of bacteria does play an important role in causing infection of root canals. Diagnosis of C. albicans in primary root canal infections as well as in refractory periodontitis calls for further antifungal susceptibility testing for drug discovery and epidemiology and to predict therapeutic outcome. Technical assistance from Mrs. Shobha Reddy, Department of Microbiology, M. S. Ramaiah Medical College and Teaching Hospital, Bengaluru. Baumgartner JC, Hutter JW, Siqueira JF. Endodontic microbiology and treatment of infections. In: Cohen S, Hargreaves KM, editors. Pathways of the Pulp. 9th ed. St. Louis: Mosby; 2006. Sen BH, Piskin B, Demirci T. Observation of bacteria and fungi in infected root canals and dentinal tubules by SEM. Endod Dent Traumatol 1995;11:6-9. Waltimo TM, Sen BH, Meurman JH, Ørstavik D, Haapasalo MP. Yeasts in apical periodontitis. Crit Rev Oral Biol Med 2003;14:128-37. Siqueira JF Jr., Sen BH. Fungi in endodontic infections. Oral Surg Oral Med Oral Pathol Oral Radiol Endod 2004;97:632-41. Sunde PT, Olsen I, Debelian GJ, Tronstad L. Microbiota of periapical lesions refractory to endodontic therapy. J Endod 2002;28:304-10. Byadarahally Raju S, Rajappa S. Isolation and identification of Candida from the oral cavity. ISRN Dent 2011;2011:487921. Haapasalo M. Bacteroides spp. in dental root canal infections. Endod Dent Traumatol 1989;5:1-10. Grossman LI. Root Canal Therapy. 3rd ed. London: Henry Kimpton; 1952. Kerawala C, Newlands C, editors. Oral and Maxillofacial Surgery. Oxford: Oxford University Press; 2010. p. 446, 447. Gomes C, Fidel S, Fidel R, de Moura Sarquis MI. Isolation and taxonomy of filamentous fungi in endodontic infections. J Endod 2010;36:626-9. Slack G. The bacteriology of infected root canals and in vitro penicillin sensitivity. Br Dent J 1953;3:211-4. Slack G. The resistance to antibiotics of microorganisms isolated from root canals. Br Dent J 1957;18:493-4. Kumar J, Sharma R, Sharma M, Prabhavathi V, Paul J, Chowdary CD. Presence of Candida albicans in root canals of teeth with apical periodontitis and evaluation of their possible role in failure of endodontic treatment. J Int Oral Health 2015;7:42-5. Najzar-Fleger D, Filipovic D, Prpic G, Kobler D. Candida in root canal in accordance with oral ecology. Int Endod J 1992;25:40. Magare J, Awasthi RS. 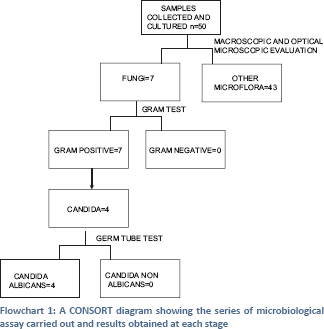 Evaluating the prevalence of Candida species in the oral cavity of immunocompromised patients. IJSR 2014;3:2319-7064. Zaremba ML, Daniluk T, Rozkiewicz D, Cylwik-Rokicka D, Kierklo A, Tokajuk G, et al. Incidence rate of Candida species in the oral cavity of middle-aged and elderly subjects. Adv Med Sci 2006;51 Suppl 1:233-6. Resende JC, de Resende MA, Saliba JL. Prevalence of Candida spp. in hospitalized patients and their risk factors. Mycoses 2002;45:306-12. Kaur A, Singh Soodan P, Singh Soodan K, Priyadarshni P. Evaluation of prevalence of Candida species in the root canals and oral cavity of children and adult patients. IOSR J Diagn Med Sonogr 2014;13:100-4. Dumani A, Yoldas O, Yilmaz S, Koksal F, Kayar B, Akcimen B, et al. Polymerase chain reaction of Enterococcus faecalis and Candida albicans in apical periodontitis from Turkish patients. J Clin Exp Dent 2012;4:e34-9. Peciuliene V, Maneliene R, Balcikonyte E, Drukteinis S, Rutkunas V. Microorganisms in root canal infections: A review. Stomatologija 2008;10:4-9. Candida albicans; fungi; primary endodontic infection.